Picture This are an Irish band who are relatively new to the scene. The band is composed of Ryan Hennessy, Jimmy Rainsford, Owen Cardiff and Cliff Deane. In 2017, they released their debut album, which entered atop the Irish Albums Chart. 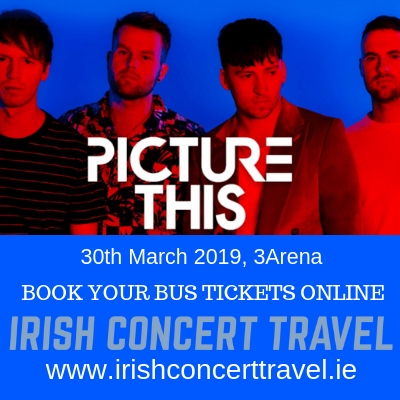 Irish Concert Travel have buses travelling to Picture This in the 3Arena Dublin for all of their five upcoming concerts taking place in March 2019. On this page you can book your bus tickets for the concert taking place on the 30th of March 2019. Please make sure you book your bus ticket for the correct date.